So we went to go see Will Ferrell's The Other Guys this weekend; it was not one of our favorite Ferrell comedies — Mark Wahlberg is not self-aware enough to do comedy; he is at his funniest when it is unintentional — but it has its moments. A fun ongoing gag: Wahlberg's cop character has been reassigned to desk work because, while working security at a Yankees game, he accidentally shot Derek Jeter. (The best line comes from another cop yelling at Wahlberg: "You shoulda shot A-Rod!") Jeter shows up in a cameo during this scene — he is as convincing as someone who has just been shot as you might suspect — but a second scene, in which he is homeless after Wahlberg ruined his career, was cut from the film. 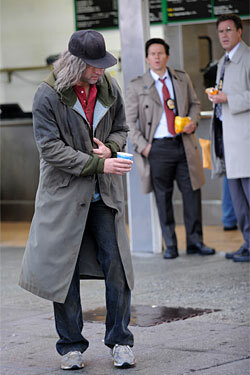 (Jeter as homeless man was a fun photo meme last November.) At the end of the film, Ferrell's and Wahlberg's characters are at Nathan's, like in the picture, and there is a homeless man digging through the trash in the background, but it's never identified as Jeter, and the homeless joke is never used. Sorry, Derek. At least Seinfeld appreciated you.